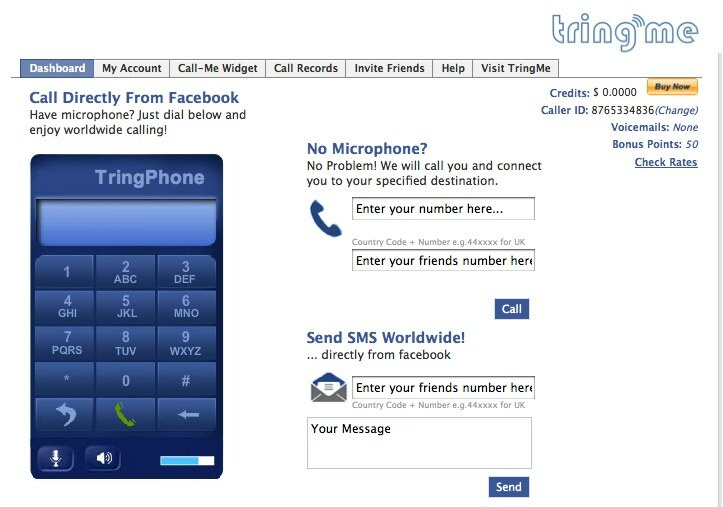 VoIP startup TringMe has launched a Facebook application that lets users make calls from the social network using its Flash-based web phone for browsers. The app also lets you embed widgets to your profile for your Facebook friends to call or SMS you. The app has much of the functionality that a regular VoIP app like Skype has. TringMe’s app lets users set up caller-id, send SMS messages from Facebook, lets callers leave voicemails that the users can access and lets you add TringMe widgets to your profile that let friends and visitors call or SMS you from that page, which seems to be the most appealing feature of the app. And if you have a TringMe account, you can integrate your account with Facebook. Of course, you have to buy credits to use the application, which range from $5 to $100 worth of credits, bought via PayPal. Facebook also has a similar Skype-based app called SkypeMe. that lets you Skype your friends. TringMe also recently launched a demo of a widget that now allows a user the ability to make a VoIP call from Microsoft Silverlight applications. Silverlight doesn’t allow access to a microphone, thus restricting VoIP calls, so TringMe used a backdoor Flash widget to access the microphone.